The two as yet unidentified male suspects rolled up to the target house in a stolen black SUV at approximately 7:45am local time last Thursday. 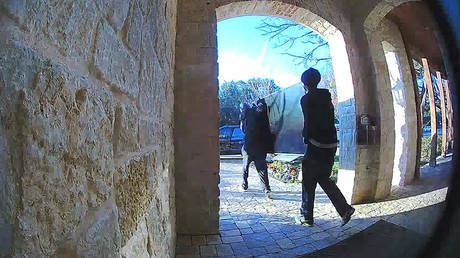 As visible in the doorbell security camera footage, the two men casually walk up to the front door and force their way in. They then emerge carrying a large plasma screen TV between them. After several failed attempts to fit the oversized television into the stolen vehicle, the two defeated men nonchalantly turn around and begin their walk of shame, TV in hand, back into the burglarized home, leaving the device before making good on their escape. The vehicle was abandoned shortly afterwards and recovered by investigating police who are still attempting to track down the criminally stupid crooks.